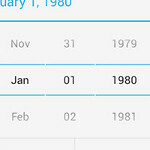 A couple days ago after people had time to look through the new Android 4.2 update, it came to light that the People app had somehow removed December from the calendar. The issue didn't affect the Calendar app, but it did make it difficult to set up birthdays or anniversaries in December. Well, good news! Google has confirmed that December does exist, and there is a fix in the works. Google didn't say exactly when there would be an update fix for the problem, but the post acknowledging the issue would like you all to know that if you have a birthday or anniversary in December, it "won't be forgotten by your friends and family." I already fixed mine - with Android, I never worry. I even have 4.2 JB on my captivate, RAZR and Nexus 7 tablet. Google maybe also address a network issue on the Galaxy Nexus. Bars have been dropping randomly since updated to 4.2. First my iPhone with iMessage, now my one x with missing months. Geez what's next??? Hopefully you will end before that lol be positive!